Not surprisingly because of recent disputes in the West Philippine Sea between China and the Philippines, two thirds of Filipinos disapprove of China’s leadership according to a Gallup Poll conducted in May 2015, the results of which were released just two days ago. The poll was conducted using face-to-face interviews with 1,001 people in the Philippines aged 15 years and older. The margin of error is placed at ± 3.7 percentage points with the confidence level in the poll’s accuracy pegged at 95%. The latest results show that 65% of Filipinos disapprove of China’s leadership, 25% higher than the figure for 2011 when the West Philippine Sea dispute between China and the Philippines started to heat up again. Significantly, the disapproval rating is 33 percentage points or more than twice as high as the 32% in 2010 before the West Philippine Sea tension started to rise again. 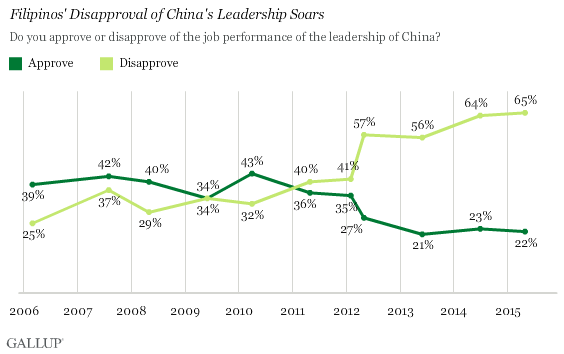 It is also 40% higher than the disapproval rating for China’s leadership back in 2006. 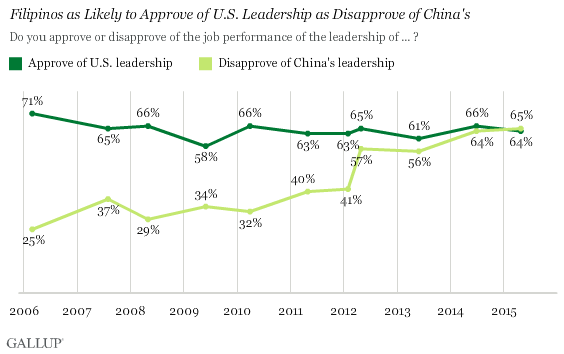 Obviously, the number of Filipinos who approve of China’s leadership has also declined 14% percentage points from the 36% in 2011 to last May’s 22%. The approval rating for 2006 was at 39%. 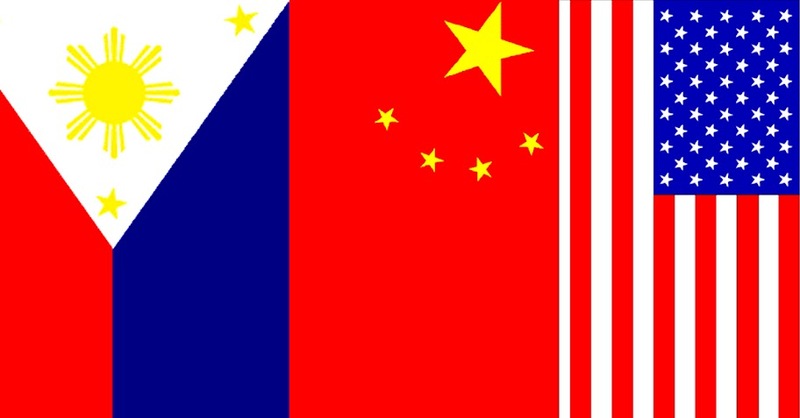 To the casual reader, it may seem odd that there are still those who approve of China’s leadership at all given that country’s recent aggressive posturing in the West Philippine Sea. Perhaps it needs to be pointed out, however, that the diplomatic friction between the two countries aside, the business relationship continues to be strong. Contrary to the opinion frequently taken to the streets by militant groups and just as frequently beamed live into living room sets across the nation by the primetime news, two thirds of Filipinos are also likely to approve of United States leadership. The 2015 figure is 64%, slightly up from the 63% in 2011 but also slightly down from the 66% in 2010 before the tensions in the West Philippine Sea began to escalate again. Seen over time, it is also 7 percentage points down from the 71% approval rating in 2006. There are many ways to interpret these figures; albeit it has to be pointed out that the United States had a Republican president in 2006 but has had a Democrat in the hot seat over the last seven years. If correlated against the events in the West Philippine Sea, perhaps the absence of any dramatic fluctuations in Filipinos’ approval ratings of United States leadership from 2011-15 can also be attributed to the Americans’ cautious stance against China for most of the period. In fact, it is only this year when the Americans have taken up anything resembling a military stance against the Chinese in the West Philippine Sea. At any rate, even at 64%, the approval rate for United States leadership among Filipinos is probably just a fair reflection of the continuing affinity that Filipinos continue have for the Americans, something that doubtless goes back to the colonial years. In a related poll, Filipinos’ confidence in the country’s military institution has leaped 18 percentage points from the 64% in 2006 to 82% last May. Gallup Polls attributes this to the current government’s modernisation program for the Philippine military as well as for the soldiers’ active involvement in disaster relief efforts. 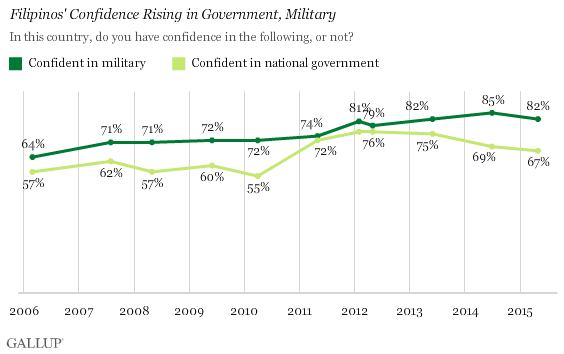 Significantly, confidence in the national government has also declined from a peak of 76% in 2012 to 67% last May. To be fair, this is still 10 percentage points higher than the 57% approval rating of the national government back in 2006. Data and image acknowledgments: Gallup Polls. If you like Buhay Batangas, please consider making a donation of any amount for its maintenance costs. Click on the button below to do so.